Welcome to the Banchory St.Ternan FC web pages. We hope you enjoy the web site which will be regularly updated with all that is going on at Milton Park. Banchory St.Ternan is the result of an amalgamation of two of the local Banchory Amateur clubs, Banchory Amateurs and St.Ternan Amateurs in 1992. After remaining in the Aberdeenshire Amateur League for one season the club made a successful application to join the Scottish Junior Football Association to play in the North Regional Junior Football Association (East Section) in 1993. 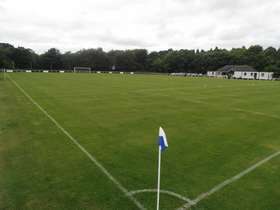 The Club play their home games at Milton Park, Crathes, about 2 miles outside Banchory towards Aberdeen. The pitch at Crathes was created in 1983 and was first used in August 1984. Over the years, the club have steadily invested in improving the Milton Park facility. Starting off with one pitch and a portable changing facility, we now have two full sized pitches, training areas with floodlights, and modern pavilion. The bell is the historic St.Ternan bell which was reportedly taken across from Ireland by the now Patron Saint of Banchory, "St.Ternan". The horn is the Horn of Leys which is part of the Burnett of Leys coat of arms. The Milton Park ground is leased from the Leys Estate.